When we got these books and dvd's I was really excited for the kid's to watch. I think it is very important for all children should know who fire fighters are fire trucks and so on but most of all I want them to know about fires and how important it is to know the facts about fires and what to do if one occurs anywhere you are. They were really interested when I played the video for them and watched everything they were doing. After the movie I spoke with them a little big about fires and what is important to do. My son also loved the book and looking at all the photo's which I think is good also. EXCLUSIVE WEBSITE OFFER! 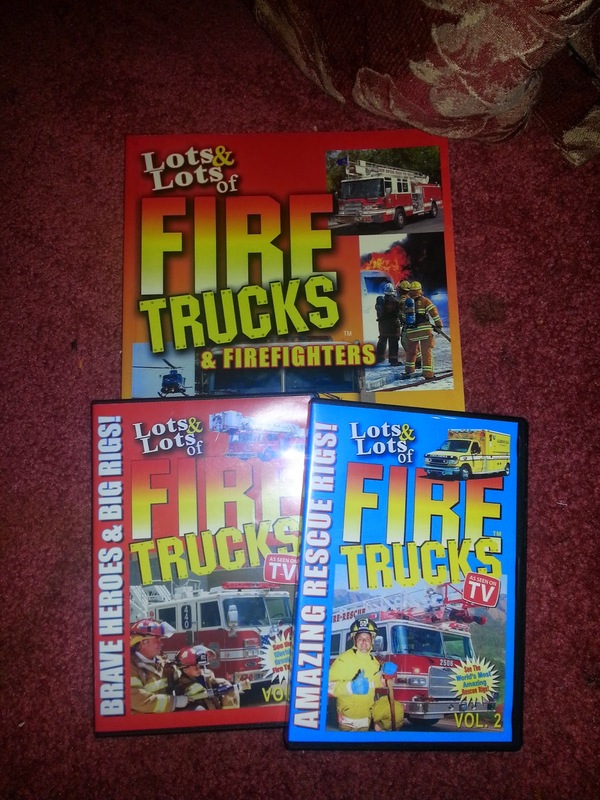 GET OUR POPULAR AWARD-WINNING Lots & Lots of FIRE TRUCKS 2 DVD SET WITH FREE AUDIO CD AND OUR 128 PAGE FOUR COLOR "Lots & Lots of FIRE TRUCKS AND FIREFIGHTERS" BOOK AT THE REDUCED PRICE OF JUST $19.95! Vol. 1 - "BRAVE HEROES AND BIG RIGS!" If you love fire trucks, get ready for the most exciting collection of non-stop fire truck and firefighting action you'll ever see! From giant hook n' ladders to spectacular super soakers, you'll see the biggest collection of firefighting and rescue equipment ever recorded on one DVD! With lights flashing and sirens wailing you'll race along on real life fire calls with real firefighting heroes and see what it's like to feel the heat, smell the smoke and taste the flames! Plus, you'll go aboard a fireboat, through the Pierce fire truck factory, climb to the top of an aerial ladder truck, and visit the busiest fire stations in North America! You'll have fun finding out about teamwork, fire safety and modern-day fire heroics from real-life firefighter Bryan "The Rat" Ratushniak as he takes you through a day in the life of a firefighter! Spectacular camera footage combined with award-winning sing-along songs and music by James Coffey and lots of real-life sounds make the thrilling action of these mighty machines a favorite among young and old alike! Also includes a bonus inspirational tribute to firemen, "A Fireman's Prayer" which gives tribute to all those brave fire fighters who risk their lives daily to save ours. Vol. 2- "AMAZING RESCUE RIGS!" Here they come... racing to the rescue, the biggest, bravest, firefighting machines in the world! 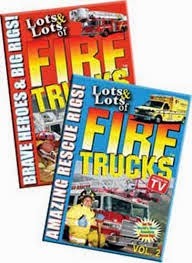 No matter what your age, if you love firetrucks, we guarantee you'll love this new action-packed DVD! From racing red fire engines and high flying choppers to giant pumper trucks and amazing rigs you'll see firefighting equipment of every shape and size. It's one of the greatest collections of emergency vehicles ever recorded on one DVD! Plus, kids and adults will have fun learning how to "Stop, Drop and Roll" and other life saving fire safety tips from Fireman Jim, America's favorite firefighter! Also includes a bonus inspirational tribute to firemen, "A Fireman's Prayer" which gives tribute to all those brave fire fighters who risk their lives daily to save ours. Spectacular camera footage combined with award winning sing-along songs and music by James Coffey and lots of real-life sounds make the thrilling action of these mighty machines a favorite among young and old alike! "LOTS and LOTS of FIRE TRUCKS and FIREFIGHTERS BOOK"
This giant, 128 page full color book is loaded with lots of exciting color photos of fire trucks and firefighters in action, interesting facts, fire science, safety tips, history, recipes, trivia, and just about everything you’d ever want to know about the world of fire fighting. Not readily available in stores so order yours today! This is the kind of book everyone can enjoy - from youngsters to oldsters! Firefighter Joe is your guide through this fun book which is also a learning tool and a reference guide that takes you into the world of firefighting. Great for home use, classroom use and fire department open houses - ANYONE THAT'S INTO FIRE TRUCKS AND FIREFIGHTING WILL ENJOY THIS BOOK - EVEN FIREMEN AND WOMEN AND PARAMEDICS! Chapters include: Meet Firefighter Joe; Firefighter's Tools & Equipment; Rescue Vehicles - Pumper, Ladder and Specialty Vehicles; Firefighting Facts; Fire Science Basics; Fire Prevention Week; Fire Prevention & Safety Tips; What is a Firefighter? ; Firefighters In Action! ; Words of the firefighter - prayers,poems and inspirations; Old Time Firefighter's Alphabet; Classic Fire House Traditions; History of Fire Trucks & Firefighting; Antique Fire Trucks; Greatest Fires in History; Firefighting Timeline; Fire House Museums; Cool Fire Related Websites; Lots & Lots of Fire Trucks Sing-A-Long Songs! Do you want to win your own set of Lots and Lots of Fire Trucks?? Enter the Rafflecopter Below for your chance to win!!!!! I give examples that they are familiar with or easy to understand for the age group. I teach my son about safety issues with either kids books are just talking him through situations that would be unsafe. No kids so I wouldn't know, but I love sharing good books. We talk about safety all the time! !